The Restaurants, Office Buildings And Private Residences. wire mesh coil drapery made of brass material. 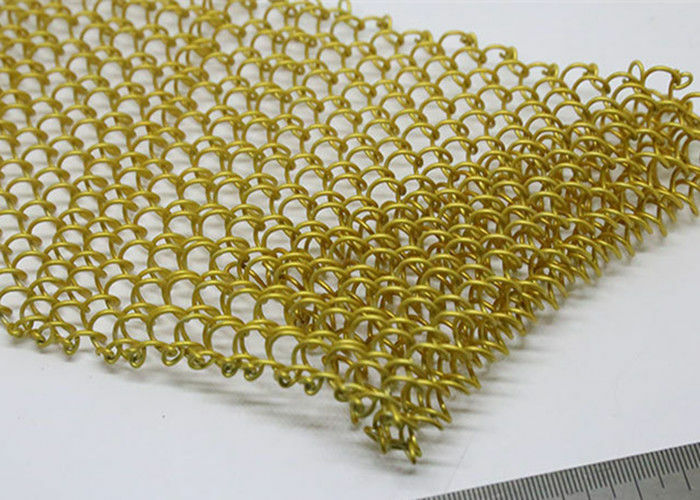 As we all known, the wire mesh coil drapery has a wide range of applications in different places for decoration. It has bright colors, soft structure and durable character, which is widely used in the restaurants, office buildings and private residences. Material: ASTM B36 26 brass alloy 70/30 (half hard). Surface treatment: clear acrylic lacquer. Coil outside diameter: 0.240 inch. Coil inside diameter: 0.158 inch. Mesh diamond width: 0.233 inch. Mesh diamond height: 0.174 inch. Mesh aperture diameter: 0.156 inch. Aluminum woven wire mesh hanging in the hall as the space curtain, through the translucent curtain, we can see the booth, large murals on wall and green potted plants on the other side. Window treatment.,Shower curtain.Exterior cladding.Space divider.Fireplace curtain.Bottle cover.Architectural drapery.Sunshade curtain. Building elevation.Staircases.Airport access stations.Museum.Opera houses.Office building.Exhibition hall.Concert hall.